Bok Choy is a simple green with a lovely texture. Even when cooked through, it has a crispness to it that plays very well with other textures in a meal. 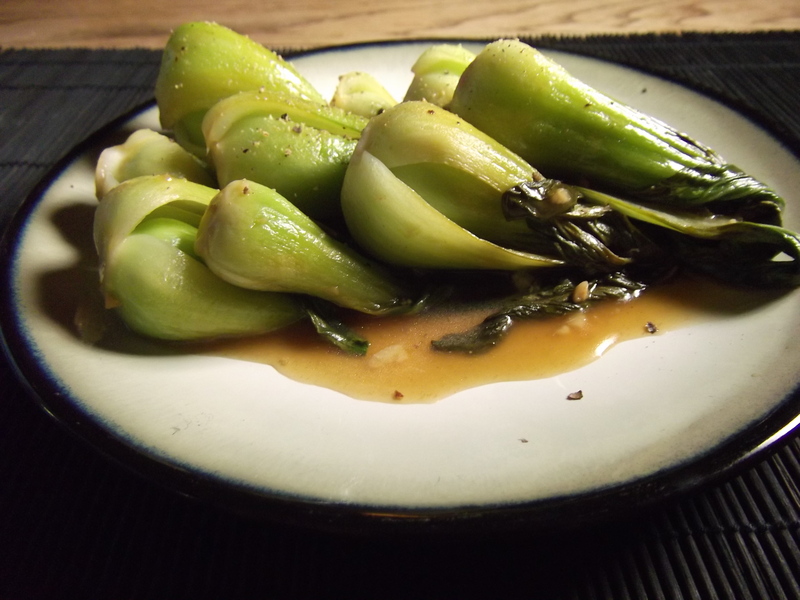 I find that simplicity is good with bok choy, so I prefer to use distinct flavors. To help get rid of pesticides, I soak mine and give them a vigorous dunking in a big bowl of water with a couple teaspoons of ascorbic acid. Shake dry before cooking. Heat oil in large pan to medium high. Wok is preferred. Cook garlic and ginger until just fragrant. Turn heat to high and add bok choy, salt, and pepper. Mix together well. Stir fry for three minutes, or until bok choy starts to soften. Dissolve cornstarch into the chosen stock. Add stock and (optional) soy sauce substitute to pan and mix well. Cook for 7-10 minutes, uncovered. Sprinkle green onions over the top and serve (I forgot mine for the photo). Looks great, it’s just coming into season too, I believe. Hi.. I have to cook a chinese food next week for my final year exam. Thanks to your wonderful post I think I have high percentage of passing this exam. More power to your site friend!